Sacred Scripture is an inspired and infallible record of God's self-Revelation to his people and the gradual unfolding of his plan of salvation. 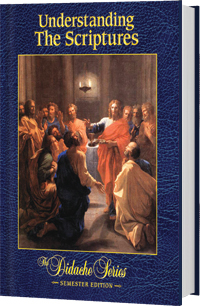 This text explains how to read Sacred Scripture with the Church and presents overviews of the books of the Bible and their importance to the teachings of the Church. It also shows how the covenants and promises that God made with his people in the Old Testament are fulfilled by the New Covenant in Jesus Christ, who is the Word of God. This book, Understanding the Scriptures, corresponds to Elective A: Scripture in the curriculum framework.